I’ve been following Peso Sense’s Facebook page for a few months now. And I find the comments very amusing. You get to know how most Filipinos think about money. And the comments poured in. Then another post came out. 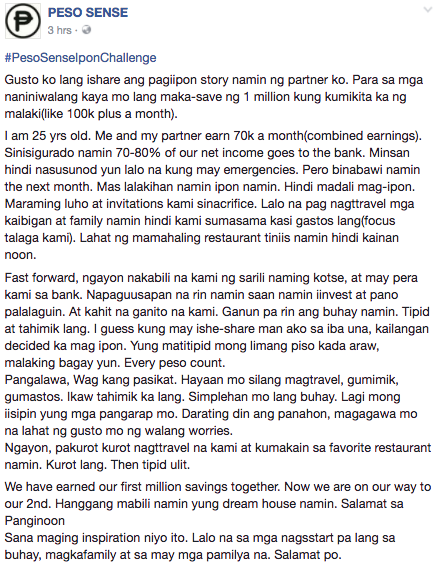 Again, the sender shares his/her story of how his/her partner were able to save their first million. I thought it’s very inspiring. They’re young but already know the importance of savings and can delay their gratification for their goals. And then I read the comments. Now I know why most people will never have their first million. Instead of getting inspired by the post, majority of the commenters have their reasons on why it’s not possible for them to have a million. And the funny thing is they have judged the story senders of not sharing their blessings and plain braggarts just by reading these short snippets of their financial achievement. 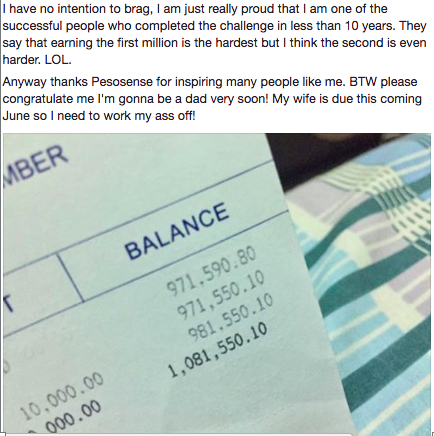 It made me wonder why majority of the commenters think that having a million is something out of reach? If you think it’s impossible, then it is impossible. And your reasons will become your reality. 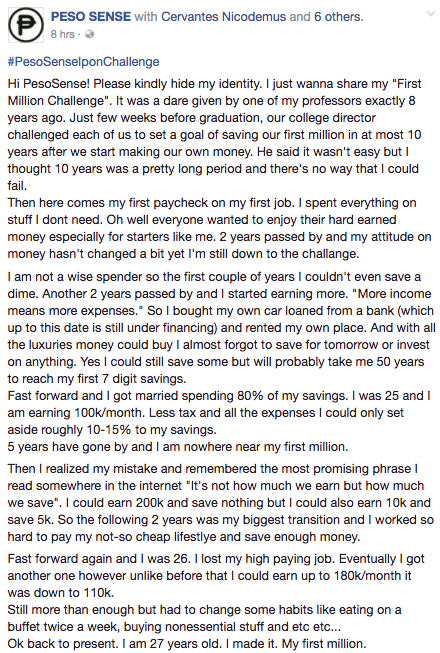 If you think it’s impossible to save for whatever reason, then of course you will never manage to save. Low-earners will say that it’s difficult to save with their meager salary. High-earners will say it’s impossible to save because of their obligations. Their thoughts become their reality. But what if you tell yourself – Yes, it’s possible! Oh! Then your chances of getting that 1 Million has increased by more than 50%. Congratulations!!! Believing that you can do it is the first step. Believing that it is possible paves way for you to achieve your goal. I truly believe that opportunities come to those who aspires more. If you are an OFW, the reason why you are in your host country is because you open yourself to that opportunity of working abroad. You wanted it that’s why you achieve it. Buying that condominium was possible because you wanted it. Your kids studying in a private school is your choice. Everything you have right know is your own choice. You let it happen. You can take that line positively or negatively, the choice is yours. But that’s the truth. This entry was posted in Musings, OFW and tagged filipina expat, filipino expat, Pinoy Blogger, Pinoy in Dubai.